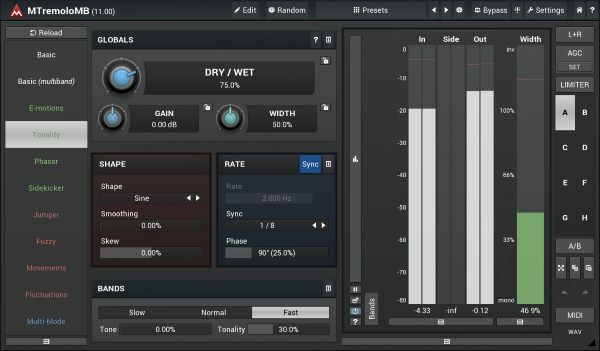 In this plugin guide we’re going to take a look at a few of the best tremolo plugin software you can get online. … but we’ve found that there’s really just a few great options to take a look at. So we’re pretty confident that you’ll be happy with any one of these. Quick answer: Soundtoys Tremolator is our favorite option in this short list, as well as the favorite for of other music productions. When you take a look at the reasons for this shortly, you’ll see why. The rest of the guide will look at this and couple other comparable options for good quality, but in different price ranges. How Does a Tremolo Plugin Work? Features to Look for in a Tremolo Plugin? Final Thoughts – Which to Get? Tremolo is a type of modulation effect that rhythmically varies the volume level of source audio. In other words, it makes your volume go up and down really fast, or to a particular rhythm. They were traditionally built into classic guitar amplifiers, but tremolo circuits have since been produced in stompbox or rack processor forms. Now there are also plenty of tremolo plug-ins available as software options on the market today, some of which are reviewed below. Most tremolo circuits modulate the volume of the signal with a low frequency oscillator or LFO. These can come in a variety of shapes, allowing more specific control over how the volume of the sound ebbs and flows. Although traditional tremolo designs typically have only sine and triangle LFO waveforms, modern hardware units and software plug-ins can include various other shapes like square, sample and hold, and more. Unless you are totally fixated on producing only vintage tremolo sounds, it would be a good idea to look into plug-ins that offer more than your standard sine and triangle LFO shapes. The availability of square waves, sample and hold, and other esoteric shapes will enable you to produce more strongly-defined and rhythmically-varied tremolo effects. For modern applications, having the option to sync to MIDI or to set the rate to beat-based values is absolutely essential. While there is something to be said about the ‘natural’ and ‘organic’ vibe resulting from free-running LFOs, being able to set the tremolo rate in time with the song’s tempo is essential for achieving rhythmically-precise results. That said, let’s take a look at the best tremolo plugins on the market. The Soundtoys Tremolator is quite possibly one of the most versatile and capable tremolo circuits available in plug-in form. It’s able to replicate the wonderfully-dizzying throb of old Fender Vibrolux guitar amps, and able to produce some very extreme effects as well. With precise dynamic control over speed and depth, the Tremolator seems to almost magically respond to the music, resulting in a pleasing and mesmerizing effect. For many users, the Soundtoys Tremolator beats out all the rest as far as sound and sheer sound-shaping capabilities are concerned. The powerful control over setting rhythms is subject to frequent praise, and the dynamic real-time expression capabilities simply serve to push it over the edge. Although it is quite a bit pricier than other options, there is no denying its ability to go where few other tremolo plug-ins are able. The Soundtoys Tremolator can handle pretty much every tremolo-related need that you could think of, and then some. It’s also equally capable of replicating the sound of classic tremolo circuits on guitar as it is at adding some serious warble to electric piano tracks. This is one of the few tremolo plug-ins that just can’t help sounding great no matter where you set the controls. That being said, you can also adjust the parameters to a remarkably precise degree if you like. The MTremoloMB is a multiband tremolo that’s quite powerful, with an impressive array of sound customizing features. MeldaProduction is understandably proud of the circuit’s adjustable oscillator technology, which makes it possible to produce sounds that are well beyond the reach of your average tremolo plug-in. The MtremoloMB lets you control as many as six different frequency bands, so there is almost no limit to how you can induce movement to your audio. It even comes with a dual structure interface, which makes it easy for beginners and more experienced users alike to get great-sounding results with minimal effort. Most of the reviews of the MtremoloMB mention the sound and ease of use as being excellent. Admittedly, most tremolo plug-ins are pretty easy to use, but the degree to which the MtremoloMB makes musical results achievable is especially noteworthy. Many users also appreciate the ability to modulate as many as six frequency bands of the source audio, each of which can have its own unique syncable settings. The plug-in has also garnered praise for its adjustable tremolo shaping options that aid greatly in creative sound design. The MtremoloMB is a perfect match for anyone in need of a fully-featured tremolo that can get into freaky territory at the drop of a hat. This particular plug-in lends itself to wildly creative audio experiments that retain the character and integrity of the original audio signal. A very capable tremolo that can handle most every typical task, the MtremoloMB packs superb value for the money in an easy-to-use package. The Kuassa EFEKTOR TR3604 Tremolo is a fully-featured tremolo plug-in that comes at a cheap price. One of its most appealing qualities is that it can capture the warm pulsating vibes of classic Fender Twin Reverb and Vox AC3 guitar amplifiers. Being a modern sound-shaping tool however, it has all the control you need over such essential parameters as tremolo speed and wave shape. 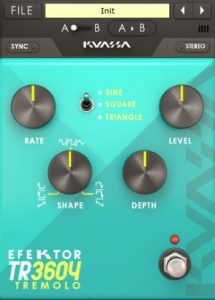 Many users that tried the Kuassa EFEKTOR TR3604 for the first time pretty much coughed up the cash for it right on the spot. For these instant converts, the ability of the plug-in to emulate classic tremolo stompbox circuits was the deciding factor. Also lauded for its simplicity and ease of use, the TR3604 nevertheless garnered some slight criticism for the relatively modest selection of usable presets. Getting the Kuassa EFEKTOR TR3604 Tremolo is pretty much a no-brainer for anyone who is in need of classic stompbox-style tremolo…which basically means pretty much everyone! But the TR3604 is capable of so much more than just traditional stompbox emulation, and you will find it to be quite capable of serving a variety of rhythmic tasks as well. Although the relative lack of usable presets might be a downer for some, it is by no means a deal breaker for a supremely useful and great sounding tremolo plug-in. Final Thoughts – Which One to Get? The Soundtoys Tremolator is the obvious winner in this roundup, with its full range of features and precise control over its many parameters. Although it is priced quite a bit more than the other plug-ins in this lineup, the cost will definitely be worth it if you are in need of a fully-featured and versatile tremolo plug-in that can handle anything you throw at it. That being said, MeldaProduction’s MtremoloMB can give you very value for the money, and you definitely won’t feel like you are missing out if you opt for this one over the Tremolator. A perfectly serviceable plug-in for most tremolo-related tasks, the MtremoloMB is able to go to some interesting extremes if the need arises. As for the Kuassa EFEKTOR TR3604 Tremolo, this is by no means the distant last place finisher of the lot. Even if this is the only tremolo plug-in you can afford at the moment, you can rest easy knowing that you have a pretty capable and decent-sounding audio-shaping tool at your disposal.